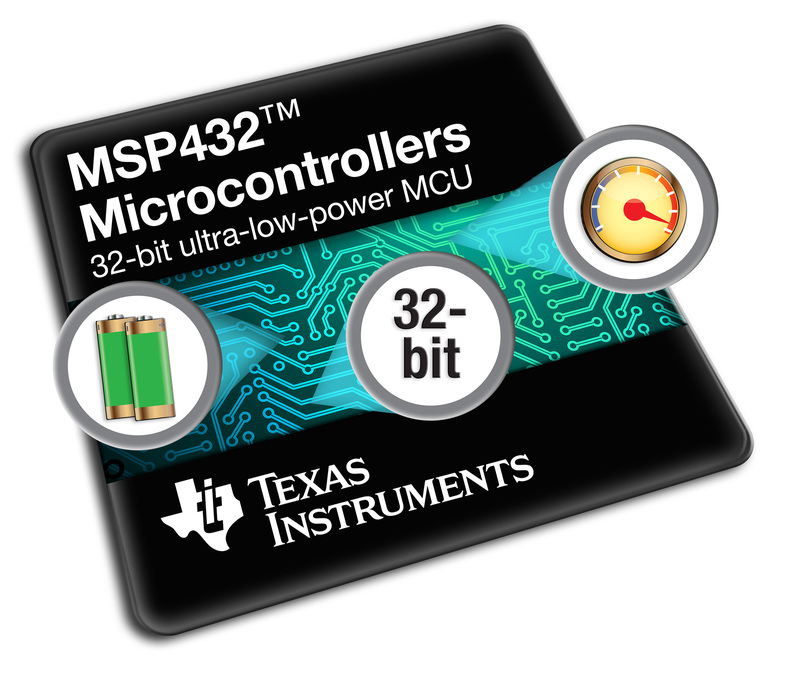 DALLAS, March 24, 2015 — (PRNewswire) — Texas Instruments (TI) (NASDAQ: TXN) today announced its MSP432™ microcontroller (MCU) platform, the industry's lowest power 32-bit ARM® Cortex®-M4F MCUs. These new 48MHz MCUs leverage TI's ultra-low-power MCU expertise to optimize performance without compromising power, while only consuming 95uA/MHz in active power and 850nA in standby power. Industry-leading integrated analog, such as a high-speed 14-bit 1MSPS analog-to-digital converter (ADC), further optimizes power efficiency and performance. MSP432 MCUs enable designers to develop ultra-low-power embedded applications such as industrial and building automation, industrial sensing, industrial security panels, asset tracking and consumer electronics where both efficient data processing and enhanced low-power operation are essential. The world's lowest power Cortex-M4F MCU. Period. The new MSP432 MCUs are the latest advancement in TI's ultra-low-power innovation, delivering a best-in-class ULPBench™ score of 167.4 – outperforming all other Cortex-M3 and -M4F MCUs on the market. This ultra-low power benchmark (ULPBench) from the Embedded Microprocessor Benchmark Consortium (EEMBC) provides a standard way to compare power performance on any MCU, independent of architecture. The integrated DC/DC optimizes power efficiency at high-speed operation, while an integrated LDO reduces overall system cost and design complexity. In addition, a 14-bit ADC consumes 375uA at 1MSPS. MSP432 MCUs include a unique selectable RAM retention feature that provides dedicated power to each of the eight RAM banks needed for an operation, so overall system power can be reduced by 30nA per bank. MSP432 MCUs can also operate as low as 1.62V and as high as 3.7V with full-speed operation to lower overall system power. As the flagship product in TI's growing 32-bit ultra-low-power MSP MCU portfolio, developers can expect the MSP432 MCU roadmap to include increasing levels of analog, integration and up to 2MB flash memory, while extending MSP430™ ultra-low-power leadership. MSP432 MCUs pack more performance into devices without compromising power budgets. The integrated digital signal processing (DSP) engine and floating-point core (FPU) of the ARM Cortex-M4F core enable a multitude of high performance applications, such as signal conditioning and sensor processing, while maintaining performance headroom for product differentiation. MSP432 MCUs include up to 256 KB flash and boost performance with dual-bank flash memory that enables simultaneous read and write functionality. An advanced encryption standard (AES) 256 hardware encryption accelerator enables developers to secure their device and data, while IP protection features on MSP432 MCUs ensure data and code security. These features result in higher throughput, more integration of advanced algorithms, wired or wireless Internet of Things (IoT) stacks and higher resolution display images – all while operating within an existing power budget. Start evaluating MSP432 MCUs immediately with a target board ( MSP-TS432PZ100) or a low-cost LaunchPad rapid prototyping kit ( MSP-EXP432P401R) with on-board emulation. Developers can expand their MSP432 LaunchPad kit evaluation with a full suite of stackable BoosterPacks, including the low-power SimpleLink™ Wi-Fi® CC3100 BoosterPack. In addition, TI's Cloud Development Ecosystem helps developers get started faster by allowing them to access their products, documentation, software and even integrated development environment (IDE) all from the convenience of the web. MSP432 MCUs support multiple real-time operating system (RTOS) options, including TI-RTOS, FreeRTOS and Micrium uC/OS. Code, register and low-power peripheral compatibility between MSP430 and MSP432 portfolios enables developers to leverage existing code and port code between 16- and 32-bit devices. EnergyTrace+™ technology and ULP Advisor software monitor power consumption in real time with +2 percent accuracy. All-inclusive, power-optimized MSPWare™ software suite includes libraries, code examples, documentation and hardware tools for 16- and 32-bit MSP MCUs and can be accessed online with TI's Resource Explorer or Code Composer Studio™ (CCS) IDE. Additional support through IAR Embedded WorkBench® and ARM Keil® MDK IDEs. Open-source Energia supports rapid prototyping on the MSP432 LaunchPad kit. Immediately leverage a broad code base for rapid firmware development by easily importing libraries for cloud connectivity, sensors, displays and more. Developers can create IoT-connected designs with more flexibility and memory, higher performance, integrated analog and compatible Wi-Fi, Bluetooth® Smart and Sub-1 GHz wireless connectivity solutions. The MSP432P401RIPZ MCU is available for immediate sampling. Upcoming devices will be available with a wide variety of features, packages sizes and up to 256 KB flash starting at USD $2.15 in 1K units. Developers can start designing with MSP432 MCUs using the MSP-EXP432P401R LaunchPad kit for $12.99 or the MSP-TS432PZ100 target board for $89. Discover the benefits of TI's ultra-low-power MSP432 MCUs. Read more about MSP432 MCUs in a new white paper. A new video shows MSP432 MCUs in action. Subscribe to the Official MSP Blog on TI E2E. Beginning with the foundation of leading process technology and adding unique system architecture, intellectual property and real-world system expertise, TI continues its 20+ years of MCU innovation with low-power and performance MCUs. With unique products for ultra-low power, low-power performance and security communications, to real-time control, control and automation, and safety, designers can accelerate time to market with TI's ecosystem of tools, software, wireless connectivity solutions, extensive Design Network offerings and technical support. MSP432, MSP430, Code Composer Studio and MSPWare are trademarks of Texas Instruments Incorporated. All registered trademarks and other trademarks belong to their respective owners.